So far we have had remarkably benevolent weather and yesterday I caught the sun a little as I was on deck filming most of the day, so today I started by putting sun screen on! It has been needed too as I have spent a good deal of today on deck filming. 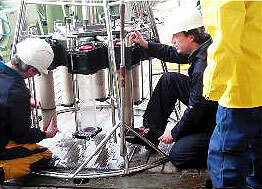 Firstly I filmed the megacorer team removing the sediment cores from the megacorer. I was told that some of the sediments were laid down 14,000 years ago! Later in the morning I was able to help with the processing as they slice the cores into sections and place them in plastic containers to be analysed for the creatures living in the sediments. Today a plankton net was deployed too. This is specially designed to catch only tiny (less than 2mm) zooplankton. It was deployed at midday and another will be deployed at midnight to see the difference in the activity in the 0 to 200m that was sampled.